Filing by hand is easier than using a drill? 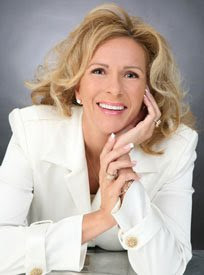 "Why do I love Hand-Filing: I love the shape and the feel I get when Hand-Filing. I feel like my nails are very personal; like a piece of art, with my signature on them. 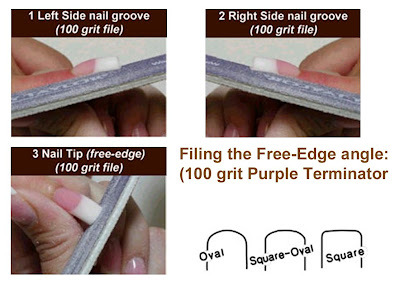 I want to have the feeling of creating beautiful nails and I do not get the same feeling when using a drill. When using a drill to shape my nails, it seems more like a factory or just a job, and I have never felt that doing nails is just a job. Doing beautiful nails is an ongoing journey; it is like we can never perfect it because we always want to do better on the next set, or the next fill-in; like an artist when they finish one creation, they want the next creation to be even more beautiful. There is something very special about creating beautiful nails, and trying to get better every single time; it definitely makes it more fun and stimulating, and it helps eliminate burn out." your nails like you have no drills & no files"; so all of your creativity and time is spent on creating the nails, which is the fun part; not the filing. Remember I hold the Record for the "Fastest" Full Set of Sculptured Pink & White Nails ever done, and in front of a live audience (less than 18 minutes), and I did them with hand-filing, no drills. Also, the husband of one of my friends, who is a doctor, told us the vibration of the drill is worse on carpal tunnel than with hand-filing. But, to make your filing and shaping simple and fast, so you do not feel the need to use a drill: I want to share with you my "5 steps in filing techniques", that I have been doing and teaching for years. one part of the nail, and getting each angle just how I like it. This not only helps perfect the nails one angle at a time, it makes filing the nails faster. File back and forth across tip of free-edge until the desired shape is achieved. Bevel up one side of the nail, across the top and bevel down the other side, using the exclusive Tammy Taylor "Horseshoe Pattern". Continue the same motion all the way to the free-edge. Use the Zebra file and file the client's angle. 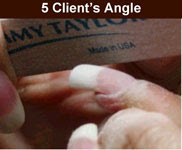 While pointing client's fingertips towards them, look at the same angle the client will be looking at. The client will be looking at this angle for the next two weeks, it must look good to them!